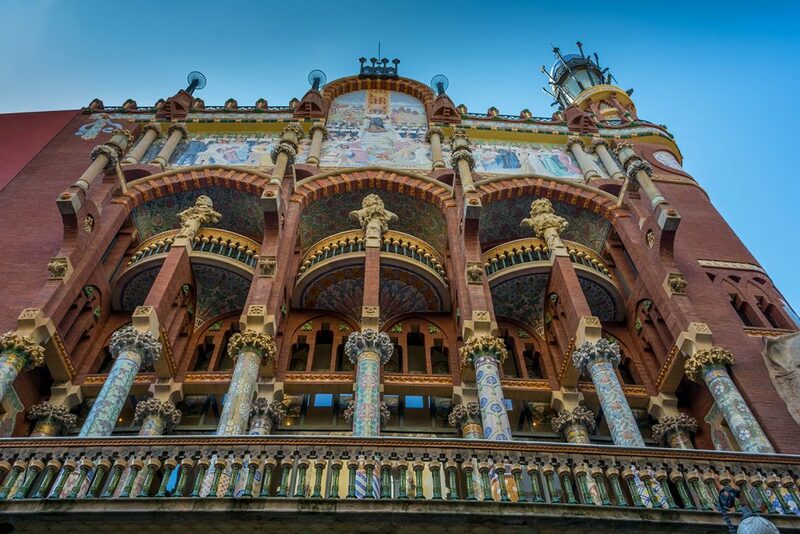 Located in the El Born neighbourhood of Barcelona, the Palau de la Música Catalana is a historic concert hall famous for its eye-catching design. The Palau de la Música Catalana is a concert hall in Barcelona designed by modernist architect Lluís Domènech i Montaner. The construction of the building started in 1905 and was finished by 1908. 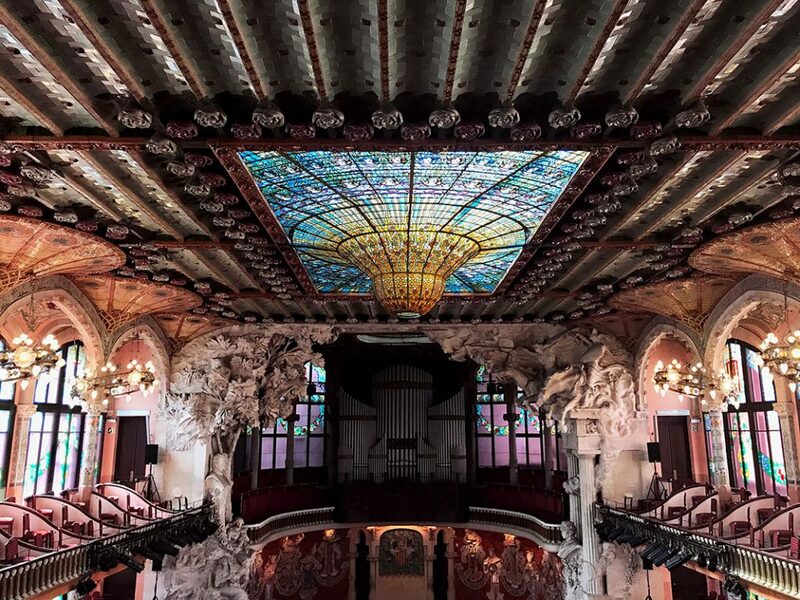 The palace was originally built for a famous choral society called Orfeo Catala, which in the beginning of the 20th century was leading a cultural awakening in Catalonia. It was inaugurated on February 8, 1908, and Domènech i Montaner was granted an award for the best building of 1908 by the city council. The concert hall was built at the height of the modernist era in Barcelona and epitomises the architectural and artistic features most associated with the movement, such as a fluidness of form, with a preference for curves over straight lines, colourful stained-glass windows and mosaics and the ornate decoration, rich in natural and symbolic themes. Domènech i Montaner gave much creative freedom to the craftsmen and artisans who were carving the famous and detailed façade of the building, which is why the structure has one of the most unique styles of Catalan architecture. When the Palau de la Música was being designed, Catalan society was going through a period of revived cultural pride known as the Renaixença or ‘rebirth’. Barcelona’s wealthy took particular interest in the construction of the concert hall and made generous donations to support it, in return asking that the design represent Catalan culture and identity through its choice of materials, techniques and symbolism. Thanks to its impressive stained-glass ceiling and clever design, the palace can rely entirely on natural light to illuminate the concert hall during daytime hours. It’s the only European concert hall to be illuminated entirely by natural light. At night, the concert hall is illuminated artificially with splendid chandeliers and other ornate light fittings. Many famous soloists, directors, composers and orchestras have been performing in the beautiful main hall of the palace, including Maurice Ravel, Igor Stravinsky, Richard Strauss, Herbert Von Karajan, Duke Ellington, Ella Fitzgerald and Woody Allen, to name a few. The Palau de la Música became a UNESCO World Heritage Site in 1997. The palace, like a peacock, shows off much of its splendour on the outside; vibrant mosaics, floral capitals and the sculpture clusters all represent aspects of Catalan music. Once inside, the foyer and restaurant areas boast beautifully embellished pillars. Best of all, however, is the richly colourful auditorium upstairs with its ceiling of blue-and-gold stained glass and a shimmering skylight. Above a bust of Beethoven on the stage stands a wind-blown sculpture of Wagner’s Valkyries (Wagner was top of the Barcelona charts at the time the building was created). This can only be savoured on a guided tour or by attending a performance – either is highly recommended. 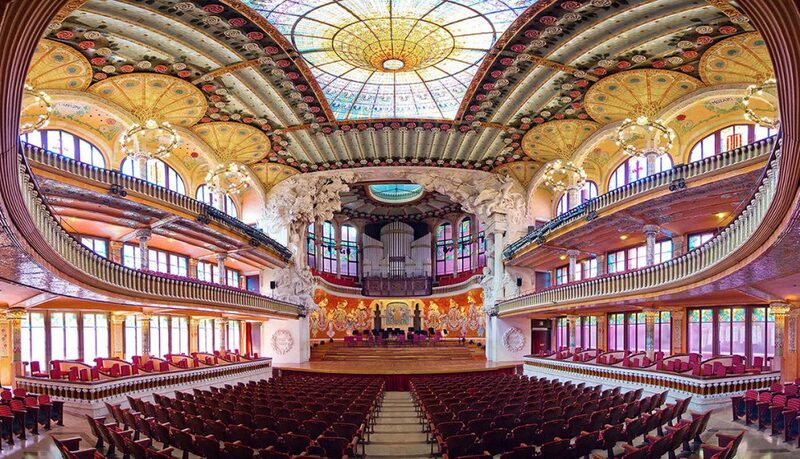 Guests can visit the Palau de la Música Catalana without seeing a show. The building has been opened to the public for daily guided tours to satisfy the public urge to see the inside. Lasting just under an hour and costing €20 per person, these tours give a detailed commentary on the design and history of the building.